The Kjeldahl method's universality, precision and reproducibility have made it the internationally-recognized method for estimating the protein content in foods, along with the combustion method (also known as Dumas technique). Johan Kjeldahl first introduced the Kjeldahl nitrogen method in 1883 at a meeting of the Danish Chemical Society. Kjeldahl, at that time Carlsberg laboratory manager, was assigned to scientifically observe the processes involved in beer production. 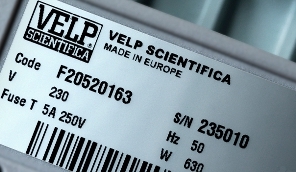 VELP Scientifica has developed the widest range of Kjeldahl apparatus consisting on digestion units (traditional or automatic models) and four distillation units with multiple innovations and features that distinguish them from conventional instruments, to respond to the different needs in R&D, QC and QA laboratories today. The goal of the digestion is to break down the bonds that hold the polypeptides together and convert them into simpler molecules (such as water, carbon dioxide and ammonium sulphate). These reactions can be speeded up by the temperature used during Kjeldahl digestion. Using the Kjeldahl distillation, nitrites and nitrates are not detected. In order to quantify these elements, a reduction of the sample is necessary (using Devarda alloy) before the Kjeldahl digestion stage.